During the opening reception. 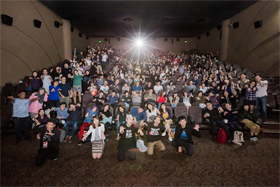 Our Japanese Film Festival 2019 (JFF2019) started with a blast at Shaw Theatres Lido on Friday, 18 January. 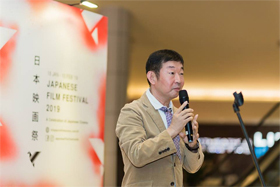 Mr Shinichiro Ueda, director of our opening film One Cut of the Dead, as well as Mr Wishing Chong, director of Yakiniku Dragon, flew in especially from Japan, and greeted our guests and audiences. H.E. Ambassador Jun Yamazaki, together with JCC (Japan Creative Centre) Director Ms Akiko Sugita, The Japan Foundation Senior Project Manager Mr Masafumi Konomi, Singapore Film Society Chairman Mr Kenneth Tan, music director of One Cut of the Dead Mr Nobuhiro Suzuki, Producers of Yakiniku Dragon Mr Toru Emori and Mr Hirotake Sasaki, and director of Zombiepura Mr Jacen Tan, were present at the opening to give their support to JFF2019 too. Do not miss the rest of the screenings at the festival, taking place from now till 10 February. 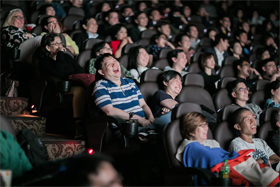 Grab your tickets here at https://www.singaporefilmsociety.com/jff/ and like our Japanese Film Festival SG Facebook page! 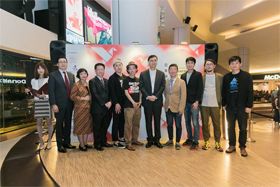 From left to right: Ms Reiko Yokoi (MC), Mr Masafumi Konomi (Senior Project Manager, Japan Foundation), Ms Akiko Sugita (Director, JCC), Mr Kenneth Tan (Chairman, Singapore Film Society), Mr Nobuhiro Suzuki (music director, One Cut of the Dead), Mr Shinichiro Ueda (director, One Cut of the Dead), H.E. Jun Yamazaki (Ambassador of Japan to Singapore), Mr Wishing Chong (Director, Yakiniku Dragon), Mr Toru Emori (Producer, Yakiniku Dragon), Mr Hirotake Sasaki (Producer, Yakiniku Dragon), Mr Jacen Tan (Director, Zombiepura). Mr Wishing Chong, director of Yakiniku Dragon. 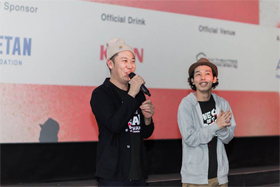 Mr Nobuhiro Suzuki (Music Director, One Cut of the Dead), Mr Shinichiro Ueda (Director, One Cut of the Dead), greeting the audience right before the screening begins.